Blinkers, we are wrapping up this first week of 2018 (happy feel good Friday!!) with some charming stories out of Chi-Town. Chance–you’ll likely spot him at a Chicago school board meeting and city council hearing–the Rapper issa legit real life Robin Hood for the windy city, y’all. Black Celebrity Giving reports Chance the Rapper dropped by a local party for inner city kids from Gyrls in the H.O.O.D Foundation in Chicago, when founder Chez Smith asked him to come through. 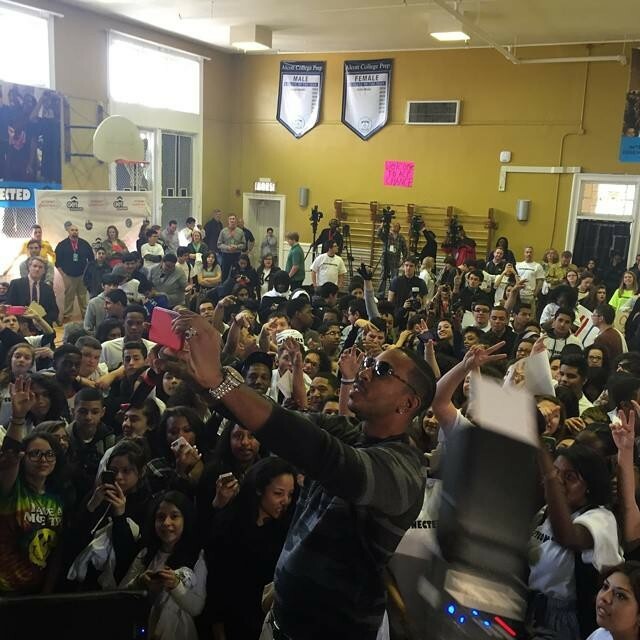 The “Down Wit That” rapper did just that by showing some love to the kiddies and supporting the foundation’s aim of empowering young girls to be responsible women. Chance the Mayor has a nice ring to it. You know, if the hip hop career doesn’t pan out. “Black-ish” star Deon Cole can be his deputy mayor. Last month the Christmas spirit guided the comedian to two Chicago Jewel-Osco grocery stores where he picked up shoppers tabs. 30 shoppers to be exact. Deon’s rep told Chicago Tribune that it was a spontaneous decision. Deon picked random shoppers to give holiday cheer. Deon bring that cheer to Charlotte. I shop at Family Lion, jus sayin’. The news arrives after his meeting with Illinois governor Bruce Rauner last week, where they talked about public education and more. Finally, some good news for Chi Town. “My name is Chance the Rapper. I’m from Chicago, Illinois. I’m here to make sure you all stay woke and vote,” said the omnipresent Chicago rapper from the stage of a concert and voting drive Monday at the Petrillo Music Shell in Grant Park. The show was announced on Friday as a rooftop concert at the Virgin Hotel with his new non-profit SocialWorks, and featuring local artists, in a youth voting drive effort. By Monday, the day of the show, the rooftop at the Virgin was traded for the Petrillo Music Shell in Grant Park to accomodate the thousands who RSVP’d on Facebook, retweeted to get the word out on Twitter, and the friends and family they brought with the them. Around two hours into the event Chance the Rapper took the stage. “I got my city doin’ front-flips!” He exclaimed, as the opening of his “Angels” was instantly taken over by the crowd. He told the crowd he wanted them, the collective “us,” to show people that Chicago’s youth want to make their voices heard, finishing his set with “No Problem” and “Blessings (Reprise)” before he thanked everyone for being part of the event. Chicago rockers Twin Peaks hit the stage next with a set that included “Boomers,” (in which bassist Jack Dolan threw in a colorful lyric about Donald Trump). “Go out and vote tonight or tomorrow! Go out and vote, it counts!” Twin Peaks guitarist/vocalist Cadien Lake James implored before leaving the stage. Chicago’s Malcolm London followed Bennett. But the big reason the crowd turned out was Chance the Rapper, who emphasized Tuesday’s election as one of the most important of our lifetime, the 23 year-old stood on stage simply as an American with a passion for doing his part. “Thank you to all the people who want to be a part of how democracy works and want to make their voices heard,” he said. With that, Chance, along with organizers from Black Youth Project 100, led the thousands of concertgoers on a march to the polls. 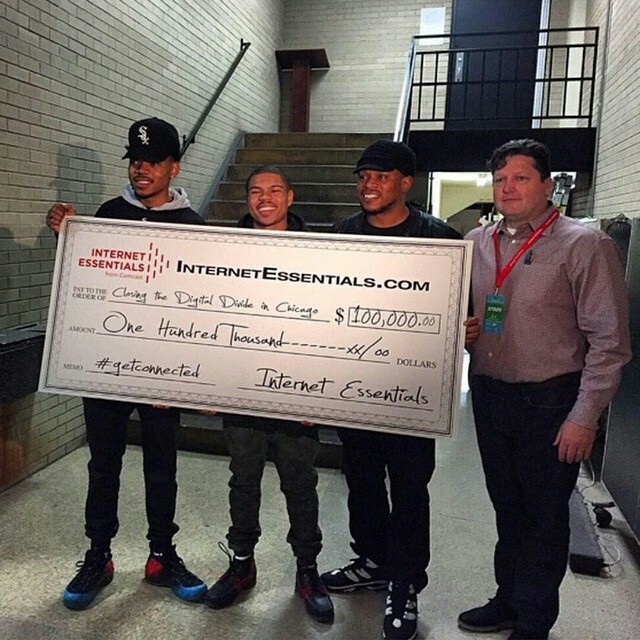 In honor of MLK day of service, Chance the rapper and Sway visited Malcolm X College in Chicago to help donate $100,000 to Chicago Public Schools. 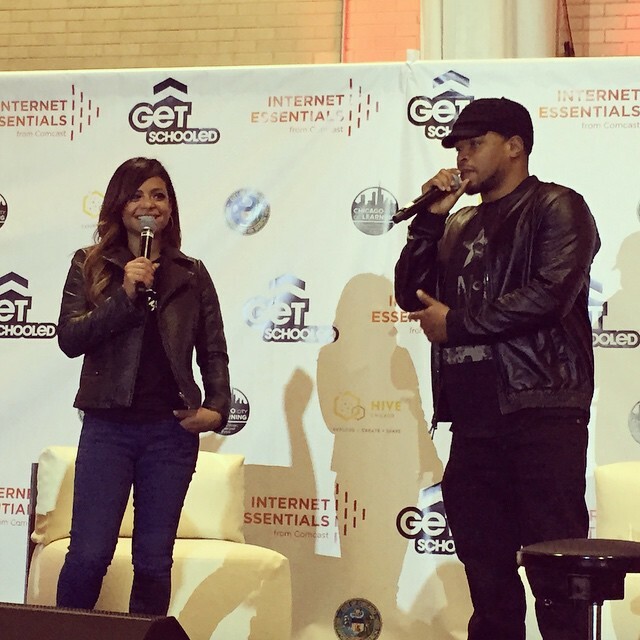 Chance, a Chi-town native, took part in the first annual Get Schooled, Get Connected Challenge event. The educational initiative was in celebration of the whiz kids that aced a series of “quests” related to digital literacy and college prep. The future techies were awarded laptops, gaming consoles and fitness gear for completing over 50,000 quests. And if free swag isn’t enough of a motivator, Internet Essentials presented a $100,000 check to divide among six high schools used to boost digital literacy in schools through new computer labs and WiFi coverage. Christina Milian made a surprise appearance to the event. “It means a lot when celebs come to the city and give back to a community they aren’t from,” says Chance, recently named “Outstanding Youth of the Year” by Chicago’s mayor, Rahm Emmanuel, for his activist work in combating youth violence in Chicago.The “Acid Rap” rapper received a plaque for his good works last year. 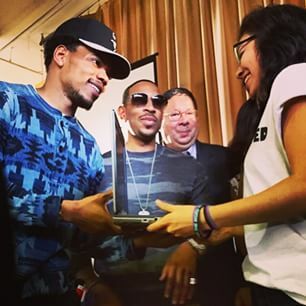 At the Get Schooled, Get Connected event, Chance talked to kids about how he used the Internet to build his music and brand and social media to boost his network. Great way to honor MLK, Chance.